One of the undersung heroes of this and other film discs is John Morgan. His reconstructions � and this is painstaking, difficult and sometimes unrewarding work � lie behind two of these scores, the exceptions being the R�zsa, which was reconstructed by Christopher Palmer and Victor Young�s Scaramouche, which is the work of William Stromberg.� As a brief note by Morgan makes clear the re-orchestrations are fiddly and difficult, deriving as they do from piano reductions and from the hard business of listening to the film soundtrack. All four scores in fact sound thoroughly authentic, richly and splendidly realised. The brief R�zsa score has plentiful Renaissance cadences and jigs and some radiant lyricism. At times it comes very close to Vaughan-Williams � try the gorgeous tune at 5.00 for the highpoint of this seven and a half minute reconstruction. Victor Young�s Scaramouche lasts a great deal longer, getting on for nineteen minutes and is tracked in nine movements. The brassy and percussive flair of the Main Title sequence leads onto some opulently scored writing of decidedly luscious qualities. Sentiment is perfectly balanced by moments of romantic melancholy. Cheeky and lyrical, with its triumphant La Marseillaise quotation sounding proud and noble, this is a treasurable score, to whose permanent reestablishment we owe a serious debt to William Stromberg. 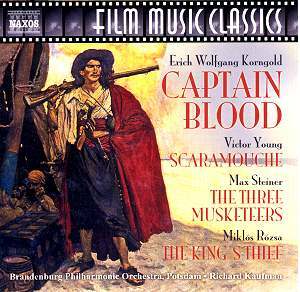 Korngold�s Captain Blood was a starring vehicle for the master of the swash and the buckle, the licentious Australian Errol Flynn. So charismatic a cinema composer as Korngold can never be gainsaid. Spinning a stirring and lyrical tune was his forte. But the vibrancy of his characterisation is what distinguishes him still further in this genre � that and his clear indebtedness to Wagner, which one can hear in the second of the six tracked sections, Slaves � Arabella and Blood. �Listen, too, to the deftly scored tension and unease generated in the music of the fourth track, to the magnificently deployed string choir writing and glittering harp arpeggios. He reserves some blazing muscle for the Pirates� Flag. Max Steiner�s The Three Musketeers unravels La Marseillaise, as did Scaramouche. In its gallantry and surging passion its cuts a fine dash billowing with bold, brassy marches, funereal dirges and love scenes. Steiner always knew how to generate powerful moods though the dash comprehensively outweighs the more uneasy tremors in this ebullient score. Oddly he comes quite close to sounding like Bliss in the fifth of the six tracks, Carriage Ride. Splendidly realised and vitally performed this is another valuable addition to the Naxos Film Classics Series.